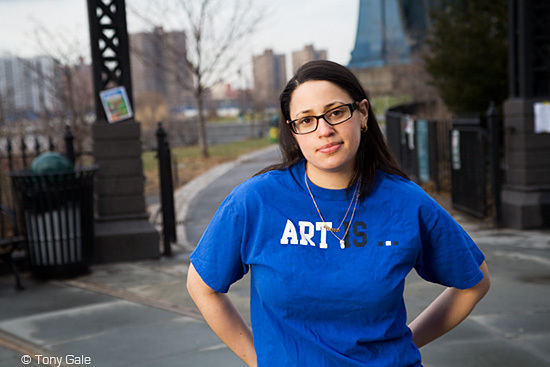 Allison Maritza Lasky, founding member of F.O.K.U.S. Allison reminds me of that slogan from the army – “we do more before 6 am than most people do all day”! and she MEANS it! Her day job, working as a preschool administrative assistant, is really just her “Clark Kent” cover to support her life and passion in supporting art. In 2003, when she was a sophomore in college, (while most of us were recovering from a frat party) Allison became a founding member of F.O.K.U.S. – a student group designed to bring a passion for art, music and outreach work to campus at the University of Michigan. Their very first event, a movie screening, brought in over 100 people. Today, F.O.K.U.S – which stands for “fighting obstacles knowing ultimate success” still exists on campus at U of M, but Allison and one of her co-founders moved back home to NYC after graduation and started it up as a 501c3 non-profit here. They have a website, a quarterly magazine and host monthly events.